The classroom has changed since my first year of teaching way, way back in 1997. I had a chalkboard, some colored chalk, and an overhead projector. There was also a TV hanging from the ceiling for Channel One news. Year two added an internet connected computer in the math office (nevermind that we had a classroom set of computers that sat in boxes for over a year…but that is another story). Now we have smartboards, social media, and the entire world in our pockets. Times have changed. My three children, 12, 9, and 8 – have no idea what a record player is or what it does. They are also clueless about cassettes, much less how to create their own mixed tape. But they can navigate iTunes to find music and upload it to their Kindle. They can create infographics – Maer made this one about the water cycle. Our students need to be exposed to the technology surrounding them, they need to explore these different technologies and use them as part of the learning process. 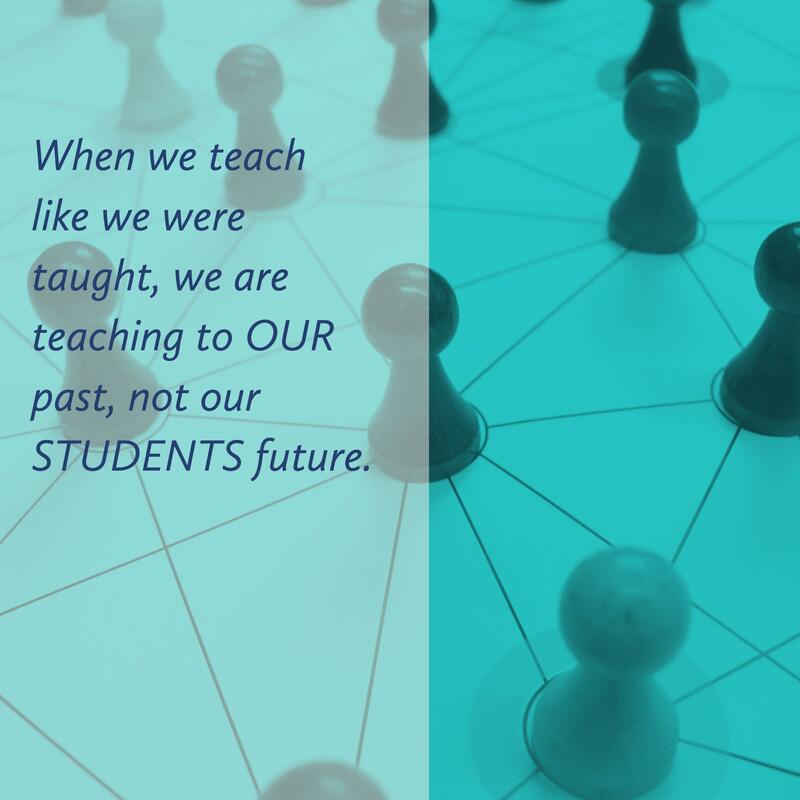 When we teach like we were taught, we are teaching to OUR past, not our STUDENTS future. Let that sink in for a second. I’m over 40. I remember working on worksheets still damp with purple ditto ink. My teachers used chalk and chalkboards. Some of them even had an overhead projector. We had film strips that had narration. One year the filmstrip projector was upgraded and automatically advanced to the next “slide.” I sat through more reel to reel movies than I can remember. Not that any of this was bad – it was what my teachers had available to them. How many teachers are still using these tools? Reel to reel and filmstrips have been replaced with DVD’s and powerpoints, but what is different? What other tools are available to teachers that we are not using? Are we still working on worksheets? I am not knocking worksheets, they have their place…but is there something better? I’m as guilty as the next person about teaching to the past, but I chose to do something about it. You can too. It is scary. Maybe even formidable. But the change in your classroom will be noticeable. Step into the world of educational technology – help you students start thinking differently. Quit teaching to your past and start teaching to their future. We have no idea what careers are coming, being developed, or emerging. However, I can make one guarantee – there will be some type of technology that will be involved in every career. It may not be programming or some other super intensive technology-based thinking. But it will require the ability to network through a connected device. It will require problem-solving. There will need to be some outside the box thinking. The ability to connect to and work with people from diverse backgrounds. It won’t be blackboards, bubble tests, or fill in the blank worksheets. How can we move away from our past? By getting plugged into the now. Think about how you are learning and growing professionally. Do you learn by doing? Does watching a YouTube video help? Do you need to map out your thinking? What about sharing ideas on Twitter or Facebook groups? What are your views on failing? Do you need to try something a couple of times first? Take these ideas for your own personal growth and apply them to your classroom. Step one – be a role model for your students. Model risk-taking and failure. Let them see you do or try something that doesn’t quite work out the first time. Allow your students to see your thinking as you modify/change what you are doing. Let that idea grow and become amazing. Step two – allow your students to be in control. This is really scary to think about as a teacher. I used to pride myself on the silent classroom until I didn’t. My classroom is messy and loud. Student’s talking and working and creating and sharing and questioning. Let your students show you what they are learning. Give them some freedom here – don’t require one size fits all. We don’t like that type of environment. Step three – that one project you have been doing for years – give it an update. Use the same rubric, change the format. Instead of a paper project, have your students create an infographic or iMovie trailer. Ditch the worksheet and have students work in teams on Google Slides, share that link with the public. Step four – don’t worry about what you don’t know or understand. You do not have to be an expert in the tool that you use, your students are smart – let them explore and figure it out. Let them problem solve and talk with each other to get past roadblocks. YOU are the content expert – be the content expert. There is no need to be the tech expert. You need to know enough to get them started. When you come up against a problem on a particular tool, ask the students. Utilize your professional network. Show your students you are willing to seek knowledge using a variety of resources. Step five – do something. Take advantage of the winter break to update a lesson you can use when the students get back in January. Don’t wait. Take that first step today, write out an outline, or re-examine that rubric. Here are links to different tools you can use. Be creative. If you need help or are looking for something specific, please leave a comment and we will crowdsource ideas!